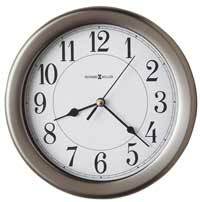 The Howard Miller Reese 625-595 Wall clock is stained with a Black Coffee finish on select hardwoods and oak veneers. The flat glass fixed front is accented by a black border with white dot pattern and polished black and chrome-finished square embellishments on the corners. White dial with applied polished chrome-finished Arabic numerals and bar hour markers, black hour and minute hands and a silver-finished seconds hand. A polished chrome-finished swinging dual-cylinder pendulum bob with metal stick is suspended below the dial. Quartz, battery-operated, single-chime movement plays Westminster chime melody on the hour and counts the hour without quarter hour chime. Automatic nighttime chime shut-off. Requires four AA sized batteries. 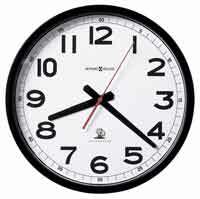 Clocks for sale at The Clock Depot including the 625-595 at discount prices.